Mr Rahman was elected as an independent after being expelled from the Labour Party for his alleged links to an extremist Muslim group, the Islamic Forum of Europe, which has been accused by the local Labour MP of infiltrating his party. The April 27 visit to support Labour’s candidate, Jon Ashworth, was part of Mr Rahman’s so far unsuccessful attempt to win readmission to the party. In emails to Peter Golds, the Tory opposition leader in Tower Hamlets, the council’s head of democratic services, John Williams, admitted that “staff from the youth service did attend in Leicester, but did so in their private capacity”. The staff were from the “rapid response” team, a community–based outreach service. Mr Golds said: “It is a blatant abuse of public money for party political purposes. If a minister had taken civil servants in a coach to campaign for a political party during working hours, we would never hear the last of it. Footage of the visit broadcast by a local television channel shows people working for Tower Hamlets council among a group wearing red Labour rosettes and campaigning for Mr Ashworth. A spokesman for the council said the staff present were “not necessarily” working at the time of the event because they might have been part–time or rostered to work outside normal hours. He insisted that “no staff due to be working on that day were absent from their ordinary duties”. But he refused to respond to questions about how the council monitored whether community–based staff were performing their “ordinary duties.” Invited to deny that any staff from Tower Hamlets were in Leicester during their duty hours, he three times refused to do so. The fact that council staff seem to have been campaigning while on paid duty is fascinating enough, but there are some more interesting wider issues at play here and ones that go right up to Ed Miliband. At the very beginning of this video, you can see a victorious Jon Ashworth thanking his supporters. In the front row, with their backs to the camera you can see the nodding heads of Lutfur Rahman and his deputy Ohid Ahmed. Ashworth then leaves the gathering and then Leicester East MP Keith Vaz manages proceedings. The Tower Hamlets contingent are singled out for praise and then at about 5mins 23 secs in, Vaz lays it on with a trowel. Ohid is picked out for setting up the Labour Friends of Bangladesh and Vaz describes how successful that group’s meeting at last year’s party conference was when 500 people packed into a Manchester restaurant. (He fails to mention that Lutfur and Ohid were both absent, having just been kicked out of the party..). Then at about 7mins 30secs, Lutfur says a few words about how much of a “progressive” he is and how “we have come to show our support for the progressive elements of Ed Miliband’s Labour party”. Why is this so significant? Well, Jon Ashworth, who is a former adviser to Gordon Brown, is a serious player in Ed Miliband’s camp as head of party relations. Keith Vaz, we know tried last year to ensure Lutfur remained a Labour party member and he is still determined to get him back in. By inviting Lutfur & co to campaign for a mate of Ed Miliband’s, speaking in Leicester mosques and using his Bengali connections, Vaz would have ensured Lutfur earned a few loyalty points. Ashworth seems to have been happy to go along with it, which might well have been a mistake given the Telegraph story and the recent revelations that Lutfur spent £115,000 redecorating his offices. Labour members in Tower Hamlets are utterly bemused by it all. During the 2010 general election, Lutfur, then the council leader, was regarded as the missing man of Labour politics. Indeed Bethnal Green and Bow MP Rushanara Ali complained to Harriet Harman last year that he singularly failed to support her successful run at Westminster. “You couldn’t see Lutfur dust,” was how one activist put it to me. So while there seems to be some cynical momentum gathering behind his attempts at readmission, thanks to the Telegraph and to Peter Golds, that has been overshadowed by the word which follows Lutfur everywhere – inept. The Water Lily Centre in Mile End Road has a long (and literally divided) history in Tower Hamlets. Completed in 1927, it was the Wickhams department store until the late 1960s. Architecturally, it was famous for the little house that splits the site (the developers had to build around the house after a family refused to move out). Last year, after decades of neglect, the site re-opened as the Water Lily Centre. It is owned by Water Lily Properties Ltd, which is owned by a group of 14 businessmen who chose the national flower of Bangladesh, representing peace and love, for their company name. Sadly, the centre is now becoming a magnet for hate. Last November, Anjem Choudary tried to stage an event there, but his luck ran out when his cover was blown. I wrote about it here. At the time, the Water Lily told me extremists weren’t welcome. However, Tower Hamlets seems to be the borough of choice for extremists, with the Water Lily emerging as one of their favourite venues. 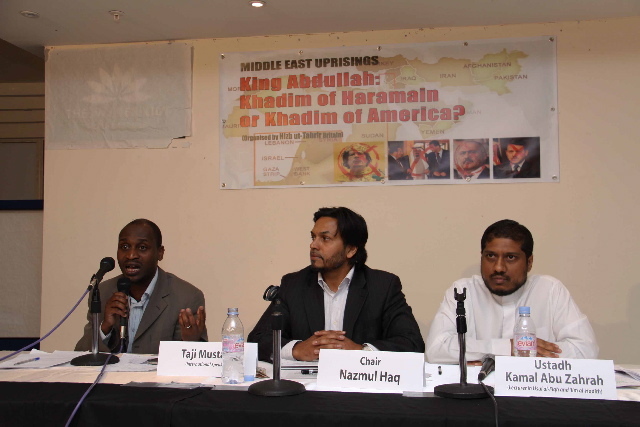 On May 13, Hizb ut-Tahrir booked an event there. You can see how the Water Lily logo has been covered up in the top left of this photo. There are more pictures to view on HT’s website here. HT is an Islamist party that campaigns for the return of the Caliphate. It is banned in a number of countries for its links to terrorism. Indeed, when in Opposition, David Cameron called for HT to be banned in Britain, although no action has since been taken. If you look carefully on HT’s website, you’ll see an advert for another event next month. Again, the venue is the Water Lily. I spoke to one of its directors yesterday. He told me the booking had been made by an organisation calling itself ‘Muslim Forum UK’. He said he was not aware it was in fact HT, but in any case, he would still allow next month’s event to go ahead. He said he and his staff always ask such groups for a list of speakers. They then check those names with the police to see if they are known terrorists or on a warning list. If the police give the all clear, the Water Lily will let the booking go ahead. These decisions are taken regardless of the personal views of any particular director, this director said. Business is business, was the thrust of his argument – and who was he, he said, to make a judgement on what might be said at an event on his property? Well, this particular director is Syed Faruk. He’s a former teacher in Tower Hamlets and he’s also the general secretary of the UK arm of the Awami League, the political party which currently governs Bangladesh. That is, he’s a senior figure in that party. So what’s that party’s view of HT? Well, it banned HT in Bangladesh in October 2009 over suspected links to terrorism. In fact, whenever senior Awami League members are themselves hosted at the Water Lily, for example Bangladesh’s Home Minister Sahara Khatun earlier this month, Hizb ut-Tahrir staged their own demonstrations outside. Mr Faruk, who is now concerned about the exposure of these links, also confirmed that Tesco is one of his tenants in the Water Lily – there’s a Tesco Express on its ground floor – and that he also takes business bookings from Tower Hamlets council. Remember how the Troxy in Limehouse decided to cancel bookings to extremist speakers when the council threatened to withdraw its own business? I wonder if the same will happen here. After all, the council has already made plain its view of Hizb ut-Tahrir. In 2008, under Denise Jones’s leadership, it withheld some Preventing Violent Extremism money from the Cordoba Foundation after I and Tory Councillor Tim Archer revealed it was being used to give a platform to Hizb speakers. Has the Water Lily signed up to the No Place for Hate campaign? Will the council continue to spend our money there? ps The Water Lily accepted another booking last Thursday for a group called ‘Bangladeshi Muslims in the UK’. More than 500 attended. I understand it was a collection of groups, including Jamaat e Islami figures. Back in January, you’ll recall I wrote this post here about Mayor Lutfur Rahman’s diary appointments. I’d asked for copies of his diary schedules for October-December 2010. You’ll also remember that what was most noticeable was the number of meetings he had been having with Takki Sulaiman, the council’s “head of communications” (mainly to discuss the upcoming edition of that week’s East End Life). Since then, some other enterprising soul has been enquiring under the Freedom of Information Act about his later diary commitments. You can see Lutfur’s diary for February-March this year here (Takki rarely features by name any more, it seems – clearly, that’d be too embarrassing). Well, about 10 days after that meeting, the word went round Brick Lane that Shiraj had been appointed the chair of the “Advisory Board for the Baishakhi Mela”. So I asked the council for its view, particularly because in 2007 it had stripped Shiraj of his beloved role in organising the festival due to accounting concerns. My last post here was largely about East End Life. As I was writing it, the Local Government Minister Bob Neill was reading a strongly worded letter from his party colleague, Cllr Peter Golds, who leads the Tory opposition on Tower Hamlets council. I am writing regarding the London Borough of Tower Hamlets response to the recent guidelines to council run newspapers. Tower Hamlets was the first to run a weekly newspaper and this organ, East End Life, has a reputation of being a notorious, publicly funded propaganda sheet. The veneer of TV listings, restaurant reviews and the description of “community newspaper” is an attempt to conceal the blatant propaganda. When the government guidelines were introduced the Executive Mayor, Lutfur Rahman, who was backed in his campaign against a Labour candidate by Ken Livingstone, initiated a review of East End Life. This was conducted by the ccouncil’s £100,000 a year Head of Communications, Takki Sulaiman, a former Labour councillor in Haringey who was a close ally of Sharon Shoesmith whilst serving as a Cabinet Member in that authority. He was also a failed Labour candidate in the 2001 general election and lost his seat on Haringey Council in 2006. He is responsible for writing East End Life, and meets weekly with the Mayor to discuss what goes in it. He would be unlikely to facilitate a review that recommended scrapping most of the responsibilities associated with his own highly paid job. In an attempt to manage the views of councillors, Conservative councillors attended a members’ forum on the paper, and, formed a majority of those present. They made their views extremely clear. The review notes of this meeting “it was felt that EEL has had a successful history publishing local news to the wider community, and has been especially successful at promoting the work of schools.” An absolutely staggering misrepresentation of an actual meeting where accurate notes should have been taken. There are other serious misrepresentations of fact. The report claims that to abolish East End Life would cost the council £2.1million, and that reductions in frequency would also involve (lower) net costs to the council. The £2.1 million figure comes from the difference the council estimates it would cost to put its statutory advertisements in the local press and the internal transfer cost of advertising in East End Life. There are three things wrong with their approach. The report bases the cost of advertising in the local press entirely from its rate card. Conservative councillors had already confirmed, in public at council meetings and in the review meeting that the East London Advertiser would offer the council a loyalty rate of £150,000 per year and making available two pages a week for 52 weeks. The review did not take this into account – because no-one involved in it bothered to phone the local press and check this out. Most astonishingly of all, the £2.1 million figure in this report doesn’t include the savings that will be made by no longer writing, printing and distributing a newspaper. The council already costs this at £1.5 million. The failure to include this sum makes the council’s claim that the net cost of closure is £2.1 million a complete sham. This consultation is fundamentally flawed and will result in the continuation of a crude propaganda sheet, sent out weekly which will damage the local, independent media and render normal campaigning completely ineffective as no political party can have regular access to campaign funds equal to those available to a local authority. I attach copies of the Tower Hamlets Cabinet Report and two recent editions of East End Life, one of which is little more than a political advertorial. There is now a real fear among some Tories that while there has been much tough-talking from Eric Pickles and his department about cracking down on waste such as East End Life (indeed at this select committee hearing last December, Grant Shapps waved a copy of East End Life in the faces of MPs to ram home just how much it was Enemy Number 1 (or thereabouts)), when punch comes to shove he’ll be found wanting. A point that Tories in Tower Hamlets are beginning to make is that the people encouraging Lutfur to fight Whitehall on this matter are Ken Livingstone’s former advisers, including Murziline Parchment. The Tories argue that Ken is using Tower Hamlets as his little incubator and that should he beat Boris next year, we will all see the return of that other waste of toilet paper, The Londoner. My Tower Hamlets – the death of East End Life? Heard of My Tower Hamlets? No, neither had I until a senior council officer friend of mine pointed it out to me. You can sign up for it here. It was launched a couple of months ago by the council’s communications department, that overpaid, over-funded, under-worked spinning machine which produces and fiddles the figures of East End Life and which is under the control of Lutfur Rahman’s friend, Takki Sulaiman (…in the interests of balance, it does employ a couple of decent people). Takki has been mentioned several times on this blog, largely because those who work with him tell me he’s a bit of a laughing stock and also because he doesn’t seem to place too much emphasis on transparency, which can be a problem when it comes to communications. However, he’s done well (for himself) and is paid the best part of £100,000 – every penny value for money, I’m sure. Prior to Tower Hamlets, he was in charge of publicity at Cafcass, the advisory service for the children and family court system. While there he set up something called….My Cafcass. It was set up in 2008/09 and was described as an e-communications portal, through which children could ‘talk’ to social workers via emails or text messages. The company Takki hired to do the work at Cafcass was Spitalfields-based Captive Minds; in fact, you can see Takki eulogising about the My Cafcass service in a video on Captive Minds’ website here. In total, Cafcass spent £406,000 on the project over three years, including £163,000 on building the portal and a further £75,00 a year running it. Although Takki described his initiative as a crucial tool, it is now defunct. In the wake of Whitehall spending cuts, Cafcass said that while it was nice to have it, it was a luxury it could do without. So almost £500,000 down the drain. Within two months of joining Tower Hamlets in March last year though, Takki embarked on something similar for this borough…et voila, My Tower Hamlets. And who did Takki get in to produce the portal…Captive Minds. According to the council’s response to my freedom of information request on the issue here, he did not even declare any interest about previous involvement with the company. I suspect it would have been more transparent for him to have done so. The FoI request also revealed that Captive Minds’ initial estimate for the project was £45,100, but that ballooned by 33 per cent to £56,295 on delivery. Some £12,500 has also been spent on text messages. So it’s interesting that while Whitehall deems these portals a luxury, our town hall seems them as a crucial marketing tool. Why? 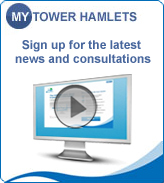 My Tower Hamlets aims to deliver news about the council and its services via text messages and emails on a regular basis.It will also send those who sign up to it details of regular council consultations. In theory, this is laudable. You only have to read the detail of the report produced for last week’s cabinet on the future of East End Life to show how completely misleading the results of such surveys can be. That just seven councillors (three Labour and four Tory) took part in two workshops on the future of the newssheet is a story in its own right. However, the broader conclusion is that not that many people take part in these exercises. If My Tower Hamlets can achieve an improvement in this area and the details of all such numbers are published then that will be a good thing. The cabinet report also states that My Tower Hamlets, via the ability of residents to provide feedback, will become a major factor in fulfilling the long term aim of moving East End Life from costly print to online. This is where localism can really work. The following email has been sent out to most, but not all councillors, in Tower Hamlets. It was forwarded to me by someone whose family is not of Bangladeshi background. I would like to invite you to a ‘Public Meeting’, as our Special Guest, that we are organising in support of and to invigorate our campaign for the delivery of ‘Bengali’, our Mother Tongue, as a Modern/Foreign Language in mainstream primary schools in England, in compliance with the Government’s Modern/Foreign Language Policy for primary schools. This meeting will commence on Saturday, 11th of June 2011, at 3.00pm, at the Waterlilly Conference Hall, 89 Mile End Road, London E1 4US (entrance on the Mile End Road, next to Blockbuster). You will appreciate that this is a common and rightful cause, thus we have to work together with absolute determination and unity of purpose, in order to establish ‘Bengali’ as a Modern/Foreign Language at key stage 2 (from year 3) in the curriculum of primary schools in the demographical areas of England, where there is a concentration of Bengali speaking communities. We have to conduct this campaign unceasingly until we achieve a successful outcome so that we can ensure that our children have the opportunity to learn their first language in primary schools, at key stage 2, and reap the immense benefits, that it will bring to them in terms of acquiring linguistic and multi-skills, improving educational attainment, developing the knowledge of our culture and roots and enhancing career and economical opportunities and to strengthening community cohesion. As a Councillor of the London Borough of Tower Hamlets, your participation in this meeting will add immeasurable weight to this campaign and your support is vital for the achievement of our right. A positive response from your good offices would be highly appreciated. The Department for Education told me the following today: the teaching of a modern foreign language is not compulsory at primary school. At secondary level, between the ages of 11 and 14, it is. It used to be the case that a major European language had to be taught. That is no longer the case: today, the only requirement is that a “world language” must be taught. World languages are not defined, but the DfE spokesman confirmed that Bengali would fall into that category. He said it would be a matter for the school governors to assess their resources and decide what to offer. The DfE spokesman said the decision of secondary schools in a particular area should be important in determining what is offered at primary level. He reiterated that it would again be a matter of resource: if the governors of a primary school wanted to offer Bengali, that would be up to them, but that might have an impact on their ability to teach other languages, such as Chinese or French. There’s isn’t a specific list of languages that can be taught at primary schools. It’s down to individual schools as to what they chose – however it is obviously dependent on the school having the relevant teachers, and good schools will usually discuss options with parents, and also with neighbouring secondary schools so that they offer the same languages. Anyone familiar with the history of Bangladesh will know that the issue of the Bengali language is emotive. Personally, I’m a great believer in children learning a foreign language: done well, it can foster a broader outlook and it is a good discipline in itself. Languages are also important in helping the children of immigrant families learn about their history, culture and roots. However, I do wonder about this campaign. Look at the language of the email: that Bengali is “our Mother Tongue”; that children will have the learn “their first language” in primary schools. I wonder whether it’s the older generation driving it. Are older Bengalis in denial about their kids and their grandchildren? Perhaps they don’t hear them speaking English as they hang out on streets or as they mess around in the playgrounds? Should public money be used to fund such lessons? Are parents not better equipped to teach their kids Bengali at home (should they wish) and so allow their children the chance to learn another foreign language at school. Perhaps learning Bengali would be the better option. But why would teaching it “strengthen community cohesion”? In previous posts, I’ve suggested that Lutfur Rahman probably needs to be careful about who he chooses as his friends. It’s quite possible that the likes of millionaire businessman Shiraj Haque and Mohammed Mahee Jalil Ferdhaus, the convicted insurance fraudster who owns the popular Bangladeshi satellite TV station Channel S, which, separately, is a major fundraiser for the East London Mosque, will want a return for their support. The latter, especially, seems to court, er, how shall we put it, the occasional spot of trouble. In the early hours of Wednesday, May 25, Mahee was allegedly abducted leaving his own office in Walthamstow, then blindfolded and taken across London before being strung up by the ankles and apparently beaten to a pulp and scolded with boiling water. After being tortured, he was allegedly later dumped on the North Circular and given £30 to find a cab to take him home and then on to hospital, where I’m told he still remains. Mahee believes his abductors were thugs hired by a business rival. Admittedly, this Kray-style account – it is a curious must-read here – does come from the website of the East London News, which is an offshoot of that well-known purveyor of accuracy, the London Bangla, but the police are involved. Since then, a 41-year-old man from Windermere Gardens, Ilford, has been arrested and charged with alleged abduction. He appeared at Waltham Forest Magistrates’ Court on May 30 and was remanded in custody. (I have his name, but for legal reasons, I’m not publishing it at this stage – anyone wanting it can contact me by email).